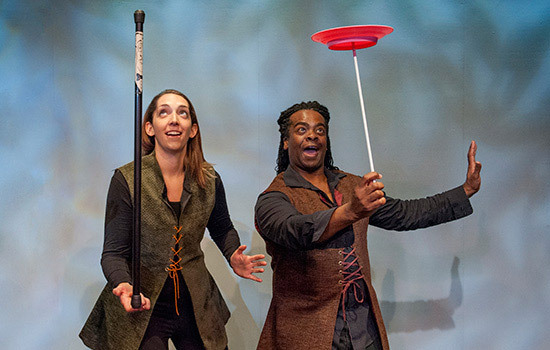 Sunshine 2.0, a traveling theater troupe from RITâ€™s National Technical Institute for the Deaf, will entertain crowds at this yearâ€™s KeyBank Rochester Fringe Festival. The KeyBank Rochester Fringe Festival, a 10-day event with more than 500 eclectic performances, begins Thursday, Sept. 14, in downtown Rochester, and several Rochester Institute of Technology students, faculty, staff and Osher members are participating with performances and exhibits. RIT also is a major educational sponsor of the community collaborative event, now in its sixth year. The festival is a celebration of the performing and visual arts in downtown Rochester, featuring world-renowned performers as well as up-and-comers. More than 67,000 people attended last year’s festival. More than a third of the festival events are free, including all of the RIT-related events, which will be held at Gallery r, 100 College Ave.; Little Theatre; and the Little Café, 240 East Ave.
RIT again plans to provide free shuttlebus service to and from campus during the festival weekends. The festival is also part of Into the ROC, a program by RIT’s Center for Leadership & Civic Engagement that encourages students to visit and volunteer off campus. RIT-related events this year include Sunshine 2.0, a traveling theater troupe from RIT’s National Technical Institute for the Deaf that highlights the fields of science, technology, engineering, arts and math; Diversity Theater: Building Community Through Storytelling, performing stories from the audience; a concert by NTID Director of Dance Thomas Warfield; performances by a cappella groups, the RIT Ukulele Club, Dangerous Signs, and more. “Creativity is in RIT’s DNA, and our participation in the Fringe Festival provides us with a great opportunity to showcase the many talented artists, performers and other creative individuals that are part of our campus community, as well as engage with the greater Rochester community in celebrating the vibrant City Center of Rochester,” said Deborah Stendardi, RIT’s vice president for Government and Community Relations. “The arts bring people together, and there is nothing better than seeing the city streets filled with people from all parts of our community, as well as visitors from far and wide, enjoying all kinds of performances in a wide range of venues,” she said. Nancy Bernardo and Mitch Goldstein, photography, video and art installations by professors from RIT’s School of Design displayed at Gallery r.
RIT Art House Showcase, a display of works from a community of RIT students who have a passion for the arts. Photo House – Visual Anticipation, an exhibit of photos from creative members of RIT’s special-interest housing community. 2017 SOFA Student Honors Show, examples of work by students from RIT’s School of Film and Animation. Osher Lifelong Learning Art Display, exhibit from the artists belonging to the Osher Lifelong Learning Institute. Al Biles and GenJam, jazz performed by human and computer. The Gallileo Band – Movin’ & Groovin’, faculty and staff perform “feel good” music, including “Soul Man,” “Groove Tonight,” and songs from Adele and Bruno Mars. WADAIKO, Taiko Japanese performance drumming. Mental Graffiti Poetry, slam poetry by students who will share original poems and favorite pieces. Sunshine 2.0, traveling theater troupe from RIT’s National Technical Institute for the Deaf, giving performances and activities for deaf, hard-of-hearing and hearing children and adults that highlight the fields of science, technology, engineering, arts and math, and more. Cuppa Tea Traditional Irish Duo, a duo performing traditional Irish music, featuring Bill Henrie on the fiddle and guitar and Adrienne Maher on guitar and vocals. Harry’s Lost Heart & Howe’s Lost Foot: An Evening with Howie Lester, Episode 5, music and true stories from around the world. Bill Destler & Rebecca Johnson: “Songs for the Journey,” retired RIT President Bill Destler plays guitar and banjo and sings, with help from his spouse, Rebecca Johnson. RIT Players Presents: The Informant, students present a short play about an FBI agent’s mission to take down a drug dealer. Eight Beat Measure, an all-male a cappella group (which won the 2017 Contemporary A Capella Recording Award for Best Hip-Hop/R&B Album). RIT’s Encore A Cappella, all-female a cappella group performs songs spanning several decades. RIT Jam Club, RIT student musicians of varying skills and backgrounds meet to play and appreciate music. Live Coding Electronic Music, musicians and coders create algorithmic music by programming it in front of an audience. Deep Listening with fivebyfive, flute quintet with visual projections and audience participation. Thomas Warfield’s Concert of Hope and Compassion, bringing together students, faculty, staff and friends in a performance of music, dance, theater, poetry and visual art that includes audience participation to help emphasize optimistic hope as a life-affirming and healing instrument nurtured by our coming together celebrating humanity. MDC/Dangerous Signs, The Tell-Tale Heart, by Edgar Allan Poe, performed in American Sign Language, spoken word, music, mime and dance. Resonant Freqs: Surveying the Spectrum, an interactive rock & roll band. Poems you should know: Collaborative Performance in Video Games, using Netprov, a collaborative improvisation fiction for social media. Signatures Magazine Presents, RIT’s undergraduate art and literary magazine offers poetry and prose readings by RIT students, faculty, staff and alumni. RIT Vocal Accent, all-female a cappella group performs empowering and emotionally charged music. RIT Surround Sound, an a cappella group with a variety of songs including barbershop. Proof of Purchase, student a cappella group performing in their signature upbeat style. Bill Dresnack Acoustic Originals, acoustic rock, pop, country and bluesy original songs. Norm & the Outliers, a jazz group of four faculty/staff members from RIT and the University of Rochester seek to bring audiences inspiration, excitement, emotional depth, humor and a feeling of how great it is to be alive. RIT Ukulele Club, performs both classic and contemporary songs. Diversity Theater: Building Community Through Storytelling, audience stories are enacted on stage by Playback Theatre actors. Out of Sync: Abstractions, a live experience that brings abstract art and avant-garde film into the realm of live performance, beginning with film loops painted by hand. RIT Improv, student improv comedy entertainment with three troupes: BrainWreck Improv, The Improvessionals and Work in Progress. A few acts will also be performing in Global Village in a sneak peek of their festival appearances. Resonant Freqs will perform from 1 to 1:45 p.m. Tuesday, Sept. 12; and on Wednesday, Sept. 13, Acoustic Originals performs at 11:15 a.m. to noon; and there will be a Signatures magazine reading from 1:30 to 1:45 p.m. The Global Village sneak peeks continue on Wednesday, Sept. 20, when MDC/Dangerous Signs performs from 11:30 to 11:45 a.m.; Acoustic Originals performs from noon to 12:30 p.m.; RIT Improv performs from 12:30 to 1 p.m.; and WADAIKO performs from 1 to 1:15 p.m.
For a complete schedule of RIT Fringe events (and notations on interpreted performances) as well as the shuttle schedule to and from RIT, go to www.rit.edu/fringefest or contact RIT Assistant Vice President of Special Events Lynn Rowoth at 585-475-7408 or lynn.rowoth@rit.edu.